The year 2017 has been turbulent for airlines in India on the On Time Performance (OTP) front. Early this year, two staffers of Mumbai International Airport (MIAL) were suspended for alleged fudging of data. While news reports indicated the regulator setting up a committee, neither did we see the report nor did we hear about the airlines which were involved. Crippling infrastructure at major and even secondary airports has led to delays for flights leading to cascading effects on the airline schedule. With utilization across airlines at an all-time high, the last flights of day are further delayed leading to irate passengers across airports. With over 18500 weekly scheduled flights amongst major carriers in the country (Excluding Trujet& Zoom Air), this article looks at how many flights are actually tracked, which airlines have maximum flights tracked and can there be a way which is far more inclusive than the current one to measure the OTP. Before looking at the stunning facts, it is important to clarify that this data is based on the schedule put out by Director General of Civil Aviation (DGCA) on its website. The flights which are scheduled to start at the beginning of the winter schedule are considered and those which are scheduled to start later in the schedule are not part of this study. There could be flights which are approved but not started by the airline. They form part of it since there wasn’t an easy way to check each and every flight for each airline. 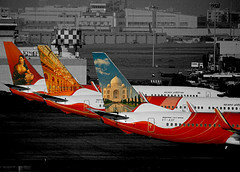 International connectors of Air India have not been considered since the schedule by the regulator does not list them. How is the tracking done currently? Until a few years ago, the airline used to report their OTP to the regulator. This system has since changed and the monthly report is based on the OTP at 4 private airports – Delhi, Mumbai, Bengaluru and Hyderabad. Most airlines have sizable chunk of operations at Chennai & Kolkata – but these operations are not considered for the calculation of OTP. Airports also declare the departure and arrival OTP for airlines operating at these airports. DGCA does not consider the OTP for a few airlines, for instance AirAsia India – which operates to three of the four airports, considered for OTP, its performance, is not reported by DGCA in its monthly summary. Very nice and thought-provoking article, Sir! Very balanced and decisive analysis.